We have been talking quite a lot about instagram lately. And why not? Instagram lets you snap instant pictures (hence the name ‘Insta’gram) and apply cool filters to it and even share them among friends. Instagram is currently available for iOS devices and Android phones. Now you can also access the power of Instagram right from your desktop. Please note that this article does not describe how to create Instagram effects. To know more about creating Instagram effects on desktop, refer to the article below. For those of you who want to explore the social world of Instagram from your computer, read on. 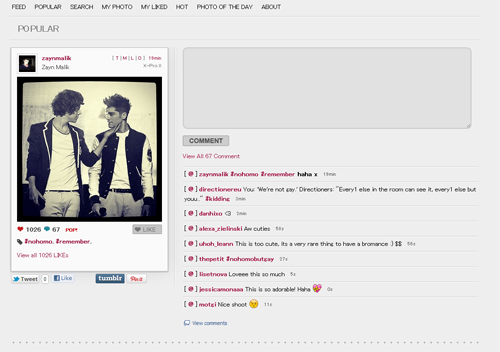 Instagrille lets you have an Instagram-like experience from your desktop. It comes inside an app manager known as Pokki which contains quite an impressive collection of popular web apps. The Instagrille app lets you view popular photos on Instagram along with comments and likes. Its interface is similar to the original Instagram app. The available features of Instagrille are Photo viewing (along with user comments and likes), Live update feeds from other users and an Account management feature. The only thing not possible with Instagrille that is available on Instagram is uploading your own photos and applying filters to them. Nonetheless, browsing through popular Instagram photos uploaded by others is as exciting as uploading an Instagram photo of your own. 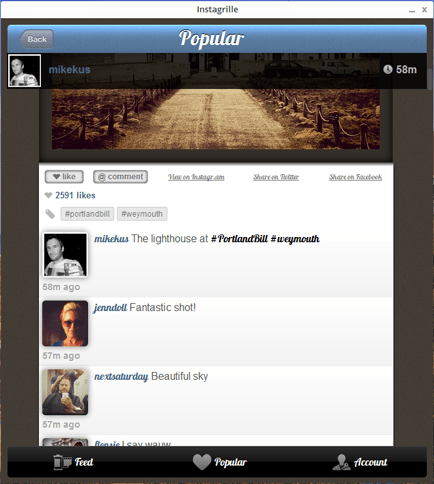 Instagram is also available as a browser app directly inside a website. Webstagram has similar features to Instagrille which lets you follow users’ uploaded photos, like or comment on them, and even see who is following you. Like Instagrille, uploading photos and application of filters is not possible. But still you get to see and comment on Instagramic photos uploaded by users around the world. Both Instagrille and Webstagram require user login in order to Like, Comment or Follow. Now the catch is that users are required to install the original Instagram app on their iOS device or Android phone in order to register for Instagram. However there is a workaround if you don’t have iPhone or an Android phone. 1 Sign up for Instagram Now! Sign up for Instagram Now!